Deep in the South Pacific, explore mesmerizing Polynesian islands as you make your way across the International Date Line to discover the stunning natural beauty of New Zealand. Papeete, the capital of French Polynesia, is by no means a sleepy town. With an international airport, wide waterfront-boulevard and new buildings, it boasts all the modern trappings of civilization. Its engaging atmosphere is vibrantly alive, a marvelous potpourri of European manner and carefree island ways. A few steps from our pier, boutiques and galleries abound as Tahitian shopkeepers dressed in bright paréos greet customers with a welcoming iaorana. The nearby open-air market is a bustle of activity. Away from the clamor of town are peaceful fern grottos, tiny villages tucked in verdant valleys and ancient sacred maraes. As your Crystal ship enters Cook's Bay, the dramatic spire made famous as Bali Hai in the movie South Pacific, towers in the distance and welcomes you to Mooréa. As this island is a jewel of crystalline lagoons, fjord-like bays, azure waters and velvety mountain peaks, it seems only natural that this exquisite island should have been selected as the location of the 1983 movie, The Bounty. The ancient Polynesians chose Mooréa as their pleasure island. Here, pristine beaches are flanked by groves of pineapple, vanilla and coffee. James Michener called it the most beautiful island in the world, for Bora Bora fulfills your every fantasy of how an island paradise should be. Majestic 2,000-foot-high peaks tower over its tranquil lagoon, their reflections mirrored in glassy waters. Thatch-roofed huts lie cradled beneath shady palms on sugar-white beaches as the scent of exotic flowers wafts through the air. Colorfully decorated le trucks wait ashore, ready to take you on a discovery of the island's awesome beauty. Nearby, glass-bottom boats lie poised, awaiting the opportunity to introduce you to an undersea world that is rich with vibrant sea life. A real-life version of an idyllic, picture-postcard tropical paradise actually does exist, and it is called Aitutaki. Pronounced Aye-too-tah-ki, the triangle-shaped atoll is the second most visited island of the Cook Islands after Rarotonga, and is famous for its turquoise lagoon, teeming with fish and surrounded by pristine beaches. Whip out your camera and aim it in virtually any direction to capture blue sky, puffy white clouds, sugary sands, azure seas and a leaning palm tree or two for a snapshot of South Pacific perfection. Bring your camera along to One Foot Island, a small islet in the southeast of the lagoon, for incredible water views and an understanding of why it is considered one of the region’s, if not the world’s, best beaches. Kia Orana and welcome to Rarotonga, the main island of the Cook group. This splendid island chain was named in honor of the great explorer Captain James Cook. Rarotonga's richly covered mountains rise 2,000 feet above white-sand beaches; and its encircling coral reefs create beautiful, safe lagoons. The hospitality here is warm and spontaneous. Smiling faces greet you at every turn of the road. Traditional cultures have been retained on an island where tranquil lifestyles are uncomplicated by the pace of the outside world. You will be captivated by the exuberant dancing and easygoing ways of the gentle islanders. Whether you’re leaping into the future or reliving the past, the International Date Line is as close to time travel as science has achieved thus far. This imaginary line stretches pole to pole at 180 degrees longitude – a point on the globe arbitrarily chosen by the International Meridian Conference in 1884, but still universally accepted. Spreading across mostly open Pacific Ocean, but conveniently deviates occasionally to allow for various islands and territories. The line effectively created the time zones that savvy travelers navigate easily (if not the jet lag they can cause). What’s most essential to remember is that crossing the International Date Line eastward means you will experience yesterday all over again, while crossing it westward give you a glimpse into tomorrow. Sprawling along the sweeping bay, Tauranga is a popular summer resort and one of the country's most important ports for the export of kiwi fruit, timber, and dairy products. It is also the gateway for Rotorua, the geothermal wonderland that is one of New Zealand's most famous attractions. Welcome to Auckland, the "City of Sails." New Zealand's largest city is along the shores of an extinct volcanic cone known as Rangitoto, often visible to the east. Auckland's population of over one million people represents almost a third of the country's total. Auckland is the perfect city from which to experience most of what New Zealand has to offer. The city lies astride a narrow isthmus between the Tasman Sea and the Pacific Ocean on two harbors, the Waitemata and Manukau. Auckland and New Zealand's geographic and cultural treasures beckon for your discovery. *All fares and savings are per person, in U.S. dollars based on double occupancy. 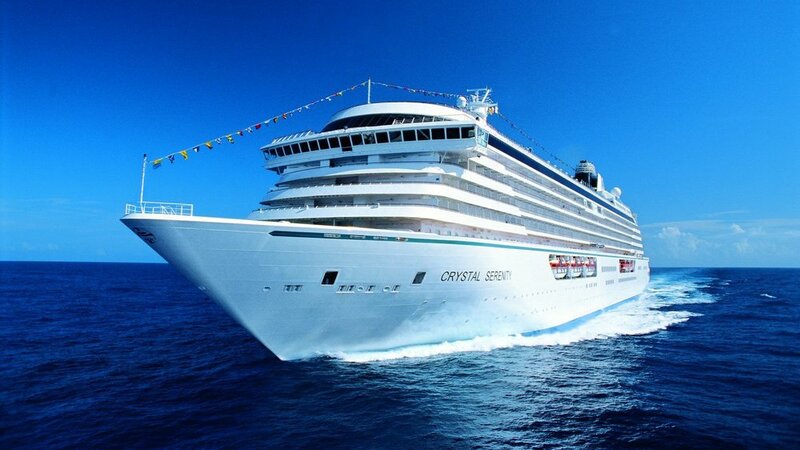 Cruise Fares and Your Exclusive Fares are cruise only and do not include taxes, fees, and port charges of $944 per person. Your Crystal Savings are subject to availability at time of booking. Book Now Fares are per person in U.S. dollars, based on double occupancy for the first two full-fare guests in suite, include all Book Now Savings, and, do not include taxes, fees or port charges. All fares and savings vary by category and departure date.